Happy Halloween! Trick or Treating with Apple Cider Doughnuts in our bellies! Beat all ingredients together until a spreadable icing forms. 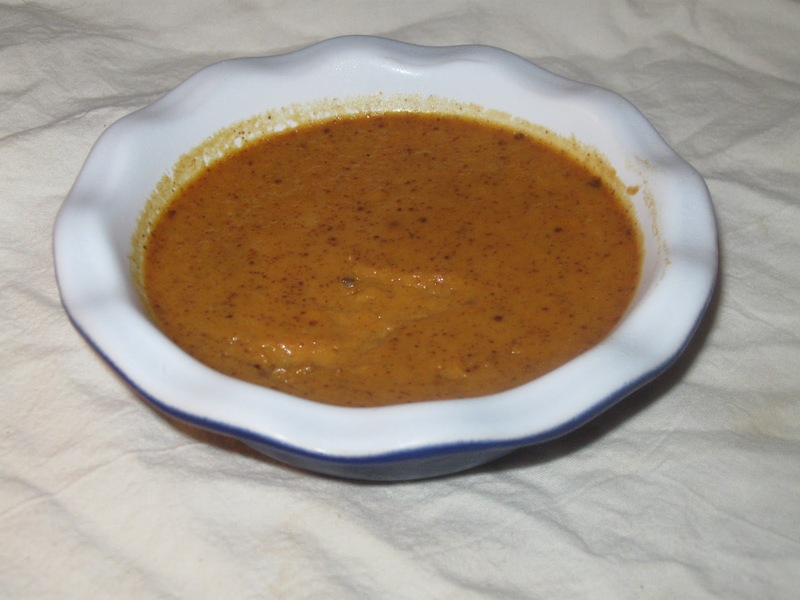 In a small bowl, sprinkle the yeast over the warm cider in the bowl of a stand mixer or large mixing bowl. Let stand until foamy, about 5 minutes. Add the flour, remaining cider, milk, butter, egg yolks, sugar, and salt until you have a soft, elastic dough that comes together easily into a ball. Place the dough in a greased bowl and cover with a tea towel or plastic wrap. Let the dough rise until it has doubled in bulk, about 1 1/2 hours. Flour a clean work surface. Place the dough on the surface and roll it out. Roll until it is about 1/2 thick. Cut out doughnut shapes. Do not reroll to dough. Place them on a parchment or silipat lined cookie sheet, cover again with the tea towel and let them rise 15-30 minutes. They should look puffy but don't need to have doubled. Meanwhile, heat (to 350) about 3 inchs of oil in a heavy pot. Fry the doughnuts (2 or 3 at a time works well) flipping at least once to insure that they are golden brown on all sides, about 2 minutes. Drain on paper towel lined plates or baking pans. Repeat for remaining doughnuts. Frost cooled doughnuts if desired. Eat the same day they are made. Gingerbread Ale Cookies sound a little wild. I definitely got some off looks when talked about the idea. My thought process was that if you can make a stout cake with a stout then why can't you make a cookie with a gingerbread ale. Why, indeed. I get really excited when I have an idea, a crazy idea, and I try it and it works. These cookies have a lovely hint of orange to them which I enjoy but if you don't you could always take it out. I saw this Gingerbread Ale from Bison Brewery and thought it would be fun to bake with, and drink of course. The ale on it's own I'm not a huge fan of but I would drink it. In the cookie it doesn't impart much of a flavor so you could also try this recipe with a stout probably or a different ale. I'm not really sure how a stout would change the texture though, I will have to experiment sometime. This is a really nice dough to work with, not to thick or thin, a little sticky, which can be helpful. I still added the typical gingerbread spices because I didn't think the beer could do it on it's own. I used Penzey's spices in these cookies as well as in the Gingerbread Toffee from a post a few days ago. If you're brave then you could leave out the spices and see what fun flavor you get. Oh! or you could leave out the spices then roll them in a cinnamon sugar mixture...that would be fun! Put the beer, molasses and honey into a medium saucepan and reduce over medium heat until you have about 1/3 cup of liquid. If any foam appears skim it off the top. Be careful of the mixture overflowing, it will happen very quickly, if it does happen. You will know you have hit 1/3 of a cup of liquid as the liquid will suddenly begin to aggressively foam due to the high concentration of sugar (This looks different from foaming due to carbon dioxide, the bubbles are much larger with the sugar foaming). Let this reduction cool to room temperature. Cream the butter and sugar together. Add the egg and blend thoroughly. Then add the orange zest, orange juice and beer reduction and blend again. Mix the flour, baking soda, and spices together then slowly add to the beer mixture. Fill a small bowl with the rolling sugar. Using a uniform scoop, scoop mounds of cookies into the bowl of sugar and roll until coated. (I used a #40 scoop which is about 1 ½ tablespoons). 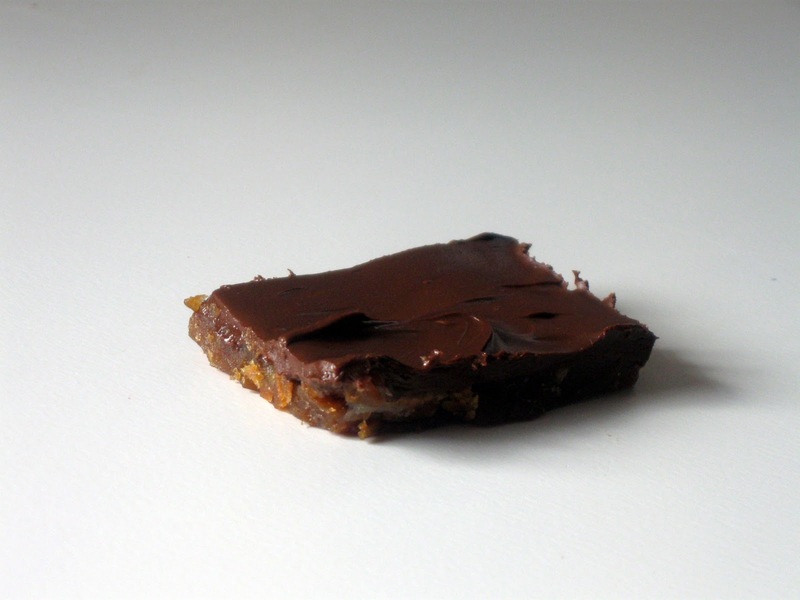 Place cookies onto an aluminum cookie sheet lined with parchment or a Silpat. Make sure you do not overcrowd the cookies; you should be able to fit about 12 cookies on a half sheet pan. Bake for 12-16 minutes. (Mine baked for 12 minutes). Let the cookies cool on the cookie sheet until they are cool enough (about 10 minutes) to transfer to wire racks to cool completely. 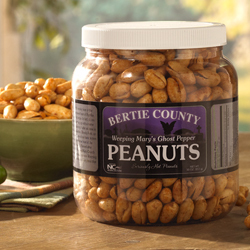 You can also use any nut or any combination of nuts. Pecans is what I had on hand so it's what I made. 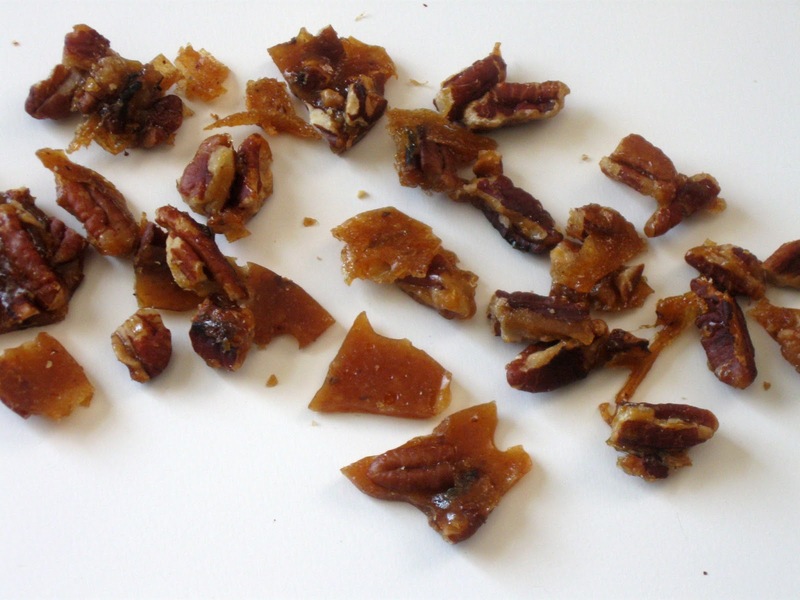 I have another recipe which I will post sometime for candied nuts which is a little different than this one and I tend to use it more often. My husband was pretty happy to come home from work to a bowl of these to munch on though. They can be sprinkled on fudge, the toffee from yesterdays post, salad for a nice treat, or stirred into cookies or brownies, anything really. 1. Line a baking pan with non-stick foil or a Silpat. You can also butter regular foil. 2. In a heavy skillet combine nuts, sugar, butter, and vanilla. Cook over medium-high heat, shaking occasionally, until sugar begins to melt. You do not want to stir it yet. 3. Reduce the heat to low and cook the mixture until it is golden brown, now it's okay to stir occasionally. Remove from heat, pour onto the prepared baking pan. Cool completely. 4. Break into pieces. Store tightly covered for up to three weeks. Of course on the way to finding dessert you find dinner, just like when you're having dessert you may already be thinking about breakfast. It's sort of like when you're having a chocolate dessert and then start thinking of chocolate chip pancakes. My grandmother used to make us homemade mac and cheese but it this is an updated version of her recipe (without Velveeta and some other modifications). This recipe is easy to change to what you like or don't like or add in some extra vegetables or different cheeses. I'm pretty sure I use a different cheese each time I make it because I use what's in my refrigerator usually :). 1. In a saucepan cook and drain the pasta following package directions. Put back in saucepan and cover to keep warm. 2. In another saucepan stir together milk, flour, salt, pepper, and cayenne until smooth, using a wire whisk. Cook over medium heat, stirring constantly, until mixture boils and thickens. Remove from heat, stir in cheese until melted, then stir in tomatoes. 3. Add pasta to cheese mixture. If desired, sprinkle with bread crumbs, spray with a little pan spray and bake at 350F until edges are bubbly and bread crumbs are brown. Pie is something my husband loves, it has always been a joke in our family because if you ask him what he wants for dessert he always says pie. We had some friends coming over for a cookout and I decided to make Peach turnovers for the occasion. There's a tiny corner missing because my son decided it looked delicious. He was right. The dough was different than any dough I had worked with. I expected it to be more like pie dough but it was smoother. It was easy to roll and cut though. I had a lot of peach filling left over so I put it into a mini peach pie for my husband and he was okay with that :). Then he had a whole tiny pie to himself that nobody else knew about. The recipe is for Hand Pies which I did some of then I just did turnovers and sealed them as much as I could on the edges, they leaked a little juice but nothing crazy and still looked really good. 1. To make the pastry, in a bowl, combine the flour and salt. Place the butter in another bowl. Place both bowls in the freezer for 1 hour. Remove the bowls from the freezer and make a well in the center of the flour. Add the butter to the well and, using a pastry blender, cut it in until the mixture resembles coarse meal. Make another well in the center. In a small bowl, whisk together the sour cream, lemon juice and water and add half of this mixture to the well. With your fingertips, mix in the liquid until large lumps form. Remove the large lumps and repeat with the remaining liquid and flour-butter mixture. Pat the lumps into a ball; do not overwork the dough. Cover with plastic wrap and refrigerate for 1 hour. If preparing ahead of time, the dough can be stored at this point for up to one month in the freezer. 3. Make the filling: Peel and chop the peaches into small bits (approx. 1/2-inch dice), much smaller than you’d use for a regular-sized pie. Mix them with the flour, sugar and pinch of salt, and add the bourbon and vanilla, if you wish. 4. Remove the chilled dough from the refrigerator, and let stand at room temperature until just pliable, 2 to 3 minutes. 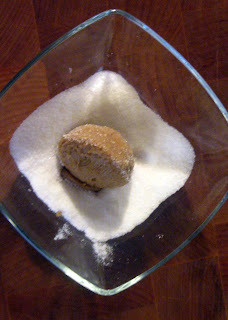 Spoon about 1 to 2 tablespoons filling (use the smaller amount for a 4-inch circle) onto one half of each circle of dough. Quickly brush a little cold water around the circumference of the dough, and fold it in half so the other side comes down over the filling, creating a semicircle. Seal the hand pie, and make a decorative edge by pressing the edges of the dough together with the back of a fork. Repeat process with remaining dough. Place the hand pies back on the parchment-lined baking sheet, and return to the refrigerator to chill for another 30 minutes. 5. Heat oven to 375 degrees. Remove the chilled hand pies from the refrigerator, cut a small slit in each and lightly brush with the egg yolk wash. Sprinkle sanding sugar generously over the pies, and place pies in the oven to bake. Bake until the hand pies are golden brown and just slightly cracked, about 20 minutes. Remove the pies from the oven, and let stand to cool slightly before serving. 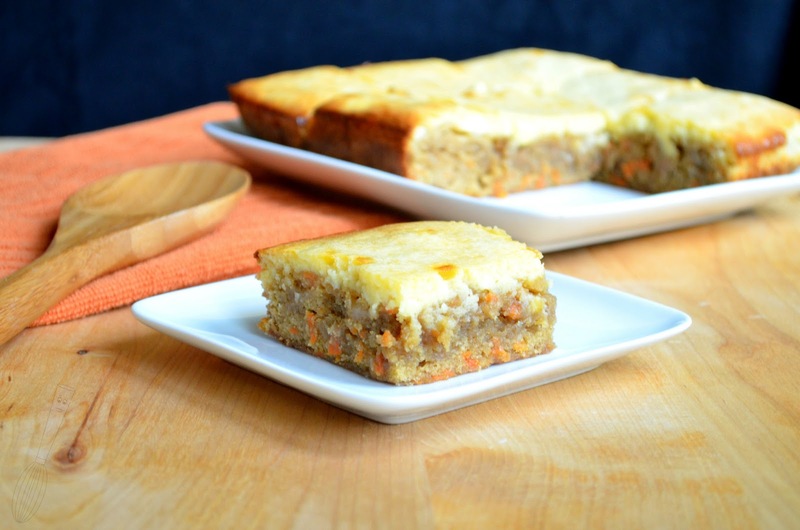 My husband loves carrot cake and so one day I thought it would be fun to make these. It took me a while to get the recipe to where I want it, but I'm really happy with it now and everyone who tries them seems really happy also :). I enjoy making individual portions of food and I used an individual "brownie" pan the first time I made this to share with you all. I've also made them in that 1 1/2" silicone mini squares pan. In a small saucepan, heat milk, water and butter until very warm, 120 degrees F (50 degrees C). In a large bowl, mix together 1 3/4 cup flour, yeast, sugar and salt. Mix milk mixture into flour mixture, and then mix in egg. Stir in the remaining flour, 1/2 cup at a time, beating well after each addition. When the dough has pulled together, turn it out onto a lightly floured surface, and knead until smooth and elastic, about 8 minutes. Divide dough into 12 equal pieces. Shape into smooth balls, and place on a greased baking sheet. Flatten slightly. Cover, and let rise for 30 to 35 minutes. Bake at 400 degrees F (200 degrees C) for 10 to 12 minutes, or until golden brown. For Hot Dog Buns: Shape each piece into a 6x4 inch rectangle. Starting with the longer side, roll up tightly, and pinch edges and ends to seal. Let rise about 20 to 25 minutes. Bake as above. These buns are pretty big. I usually make 16 instead of 12. 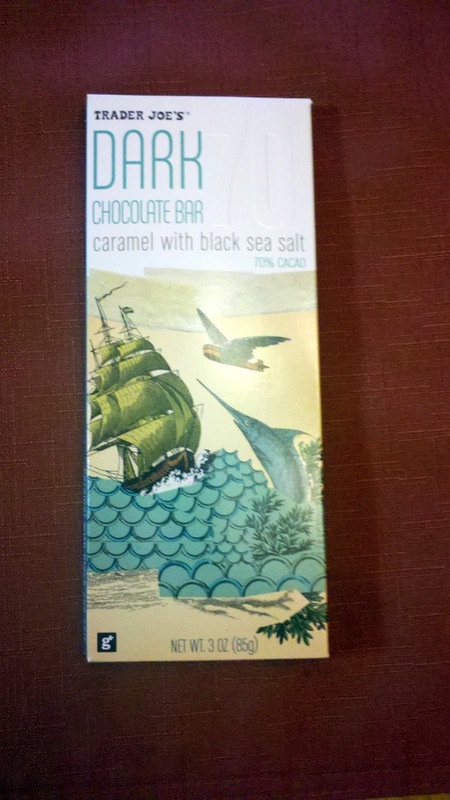 For this TILT I am excited to talk about Trader Joe's Dark Chocolate with Caramel and Black Sea Salt bar. I've always heard good things about Trader Joe's chocolate but I had not tried them before. 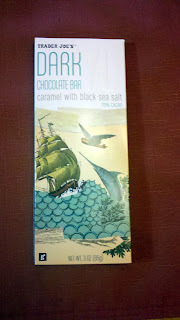 I'm sure you know I love caramel and sea salt so when I saw this it was definitely an impulse buy. I'm glad I did but I'm not sure I would again. The flavor was awesome: crisp, chocolatey, gooey caramel, and a touch of salt. My gripe with this bar is that it has scores on it for you to break it apart but I couldn't get it to break on the scores and the caramel is so runny that it drips out of the jagged edge of chocolate onto hands or whatever else. I would consider purchasing it because it tasted so good but I would think twice because I am a fan of breaking chocolate into neat squares. I realized I love Burnt Sugar Cake but it's probably because I love caramel. I'm pretty sure I've talked about that slight obsession previously. Anyway, I created this recipe when I had a hankering for some sweet cupcakes that were a little different than the average vanilla. If I ever did open a bakery then I wanted to use this for my "vanilla" cake recipe. This is a small recipe that only makes 6 cupcakes because I couldn't keep making dozens of cupcakes at a time. Although I would have made lots and lots of friends it would not have been good for the waistline you see. Lots of baking, only two of us, only so many co-workers, yes yes you see. Six cupcakes is also a lovely treat. I use the Madagascar Vanilla Bean Paste that you can find at specialty stores because I love the flavor it brings to a dessert and the look of the beans. It is a little more expensive but you don't need much. 2. Cream together butter and sugar. Add in egg and mix. 3. Add in vanilla bean paste, then flour and baking powder, mix. 4. Add in milk, stir. 5. Divide between 6 cupcake cups. Bake about 21 minutes. 1. Mix all ingredients together except sanding sugar, if using, and beat on high speed of mixer for 5 minutes until fluffy. 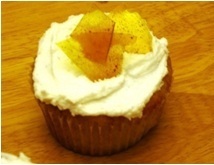 If desired, mix in some sanding sugar to taste to add crunch. Spread granulated sugar in small circles on a silpat or parchment paper in even layers. Bake at 400F until melted and golden, about 5-6 minutes. Watch very closely because it will burn if it's in the oven 10 seconds to long. When you think it's almost done you can pull it out and let it finish setting up out of the oven because the sugar will continue to bake. Cool completely, break into pieces for decoration. Since it's autumn officially I decided to make some Pumpkin Custard. I have some older magazines (don't we all) and so I looked through them and came across this delicious looking recipe. The original recipe can be found in the Taste of Home's Halloween Food & Fun magazine, it looks like from 2003 because they don't put the date on the front cover. This was super easy to throw together and in my opinion for some reason tastes better than a pumpkin pie. Do you know many bakers who don't like pie crust? I'm not really a fan so I like to make "crustless pies" which is unfortunate for my husband who loves pie, any pie. In a mixing bowl, combine all ingredients; beat on low until smooth. Place eight ungreased 4-oz. custard cups into 2 eight inch square baking pans. Fill each cup with 1/2 cup of pumpkin mixture. Pour hot water around the cups into the pans to a depth of 1". Bake at 325F for 40-50 minutes or until a knife inserted near the center comes out clean. Remove from pans to cool on wire racks. Before serving, top each with dollops of whipped topping. Makes 8 servings. This is probably one of the easiest throw together breads that there is to make. 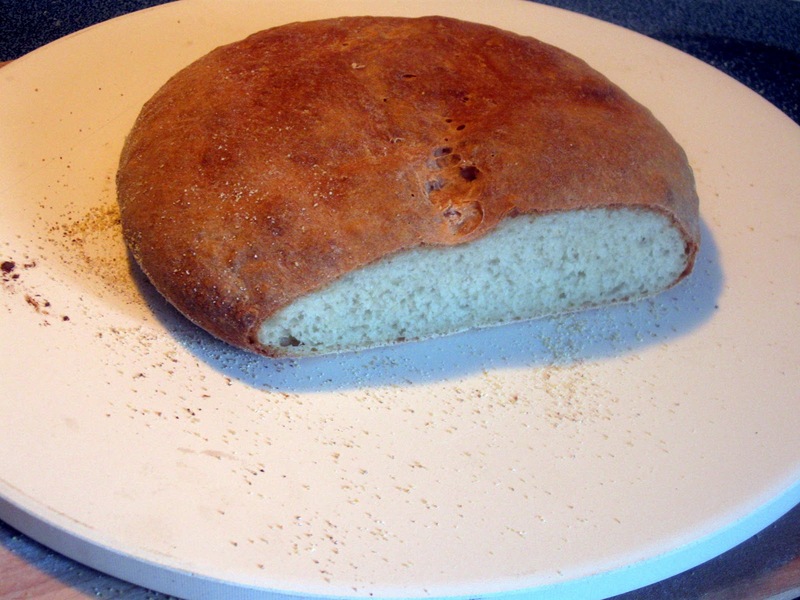 This is a basic peasant style bread with a nice crust. 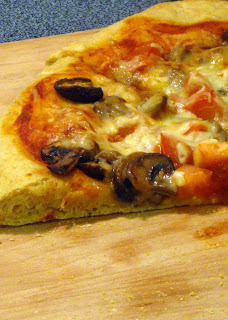 I baked it on a pizza stone so it was even crustier. Yum! If you don't have a pizza stone (or a bread stone, same thing really) and you like to make pizzas or bread this is a wonderful investment. I have three actually :) One for my toaster oven, and two full size ones for my regular oven, one square and one round. This bread is so versatile because you can add herbs, cheeses, jalapenos anyone, garlic, or anything else you think might be good. Sometimes I come up with weird combinations that sound good to me but not to anyone else, oops. Another option is brushing it with olive oil before baking and sprinkling with a course salt. Pour the warm water and yeast into a bowl and stir, let sit five minutes until foamy. Add in the salt, sugar, and flour. Mix with dough hook on mixer, or by hand until well mixed, then mix another minute or two. Place dough in a greased bowl and cover with a towel or greased plastic wrap. Let dough rise until doubled, maybe an hour depending on humidity. Shape dough and place on baking pan or pizza peel sprinkled with cornmeal, cover with plastic or towel, let rise until almost doubled. Bake at 375F until light golden brown 25-35 minutes. I did make two small loaves instead of one large loaf and put the other half of the dough in a greased freezer bag in the freezer. Then I can just pull it out the day before I want to make it and pop it in the refrigerator until thawed and proceed with the second rise then bake it. I decided since we were having chili that beer bread would taste wonderful with it. I was not wrong. :)! I had some onions left over from something else that were already cooked and I chopped them up and threw them in, that's what you see but you aren't sure what it is because it's not in the recipe. It's not in the recipe for a reason. But! This bread was really good and moist. There's also some cheese in it, shredded of course. I used Colby Jack because that's what I had but you could always use cheddar or another type if you prefer. The link for the title goes to the original recipe that I adapted. 1. Preheat oven to 350 degrees F (175 degrees C). Lightly grease a 9x5 inch loaf pan. 2. In a large mixing bowl, combine all-purpose flour, whole wheat flour, baking powder, salt, brown sugar and cheese. Pour in beer, stir until a stiff batter is formed. It may be necessary to mix dough with your hands. Scrape dough into prepared loaf pan. 3. Bake in preheated oven for 50 to 60 minutes, until a toothpick inserted into center of the loaf comes out clean.